A common saying in the collector car community goes something like this, “You buy the story and a car comes with it”. In the case of this ultra-rare 1957 Ford Fairlane 500 F Code Skyliner Retractable Hardtop the story is certainly compelling and the car that came with it nothing short of extraordinary. As if being only 1 of 17* Skyliners fitted with the F-Code Supercharged V8 engine and the only one known to exist with factory installed “POWER WINDOWS – FRT ONLY” isn’t compelling enough, the background includes all the elements of a good car story; an unusual history, a trunk full of top awards, stewardship by some of the most respected collectors in the country, a Las Vegas casino and of course the obligatory “little old lady” who only drove it to the grocery store and somehow managed to blow up the engine. Like all stories, it’s usually a good idea to start from the beginning. 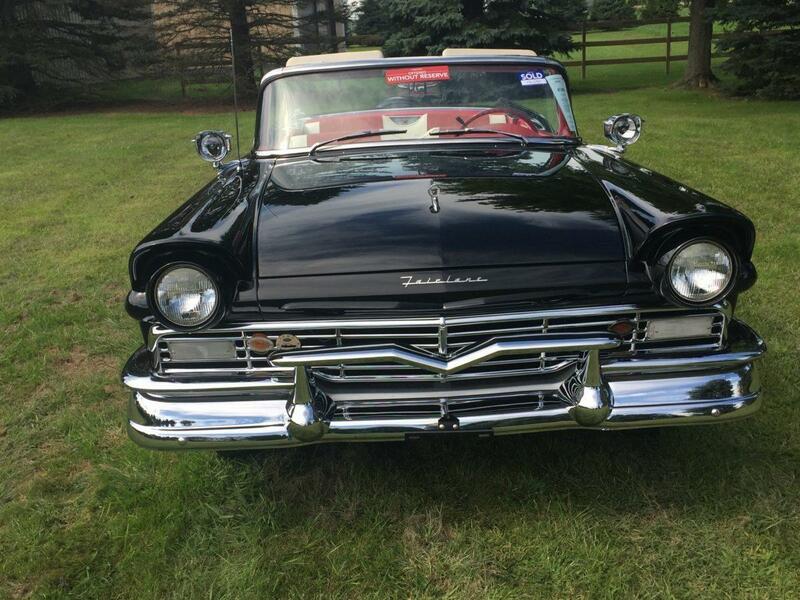 The beginning for the F Code Skyliner starts the day it came off the assembly line June 7th, 1957 at the Ford plant in Dearborn, MI. It was probably one of the last Skyliners to receive the supercharged engine since F-Code production ceased in August of ’57. On June 13, 1957, it was delivered to Boyde Boyce Motor Co. Warrenton, NC. At this point the paper trail goes cold. The car resurfaced sometime in the early 90’s when it went up for sale at Carolina Classics. 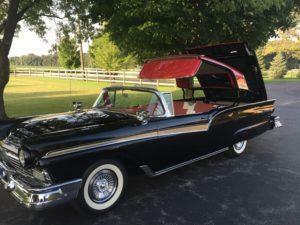 Bob Tiffin, a well-known and respected collector from Red Bay, Alabama bought the car and commissioned Dale Hileman of Akron, IN to do the restoration. Dale is a recognized expert on Ford retractables and his work is impeccable. According to Dale, the car was rust free and in remarkably good condition. Over the years owners added various chrome embellishments but aside from that the car appeared to be an intact unmolested original. 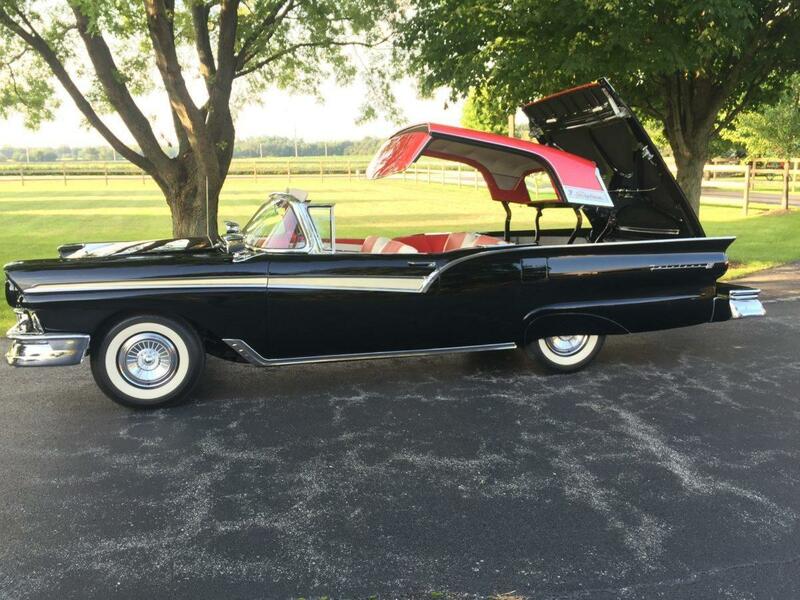 That is, until Dale acquired the original factory invoice that certified the car to be one of the very rare F-Code Skyliners in existence. The problem was that the engine in the car was not an F-Code. Somewhere along the line the supercharged V8 engine disappeared and was replaced with a standard Y-Block 312 Cu In V8. That’s when Bob Tiffin attempted to track the cars history. Bob knew that in the small towns of the South everybody knew everybody. So, he called the local drugstore in Warrenton, NC to see if he could find someone that knew something about the Boyce dealership and the car. And, as luck would have it, he made contact with one of the mechanics that worked at the Boyde Boyce dealership when the car was delivered. 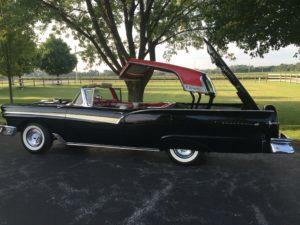 He remembered the beautiful red over black retractable because of an unusual circumstance with the car. The mechanic told Bob the car was sold to a lady that lived in the area. However, shortly afterward the car was returned to the dealership with a “blown” engine. The details surrounding the engine mishap are a mystery. Apparently more interested in having a car that actually ran rather than one that was to become a very rare and valuable F-Code that didn’t, she traded the car. The dealership installed a new standard naturally aspirated Y-Block 312 and wholesaled the car to a dealer close by in Virginia. Because of the rust-free condition of the car it is assumed that it remained in the southern Virginia/Carolina area until Bob Tiffin bought it. Dale knew he had to chase down authentic parts for the engine and he thought he had to find parts for the power windows too. The wiring harness was all there but the leads for the rear power window motors had nothing to connect to. It looked like someone converted the rear windows from power to hand crank. That was, until Dale looked at the factory invoice that clearly spelled out “POWER WINDOWS – FRT ONLY 35.00”. This factory option was so rare few even knew it existed. 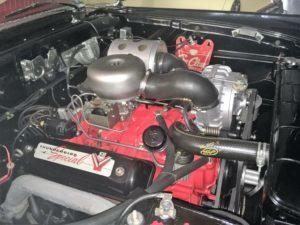 Acquiring the correct parts to install a proper F-Code engine presented the biggest challenge. There just weren’t that many F-Codes made in the first place. While exact production numbers for ’57 F-Code engines are not available we do know that NASCAR homologation rules required that at least 1,500 engines be built. But the NASCAR ban on superchargers and the Automobile Manufacturers Association prohibition against manufacture backed racing precluded reaching the required numbers and production was stopped in August of ’57. With 211 of the F code engine installations going to the ’57 Thunderbirds, the rest of the remaining F-Code engines were installed in full size 1957 Ford cars, possibly as many as 974, including the 17 known Skyliners. 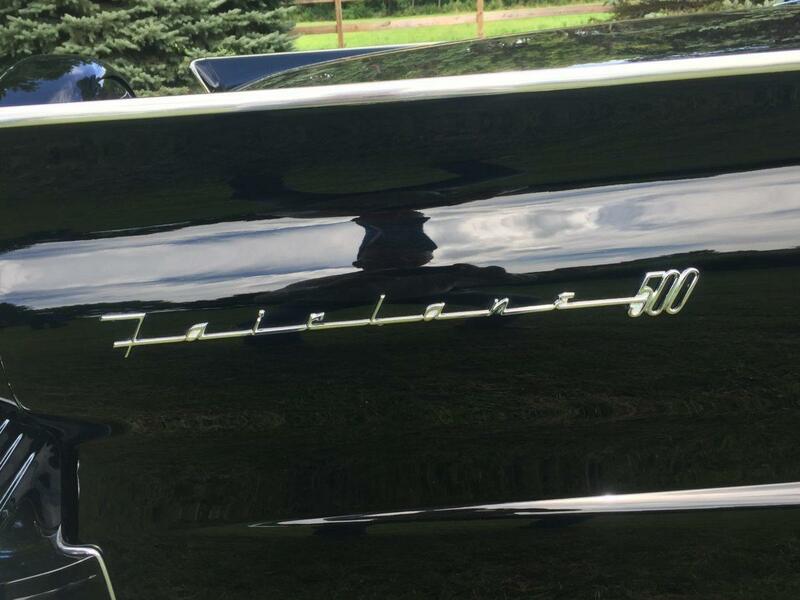 Since Dale specializes in restoring Skyliners and is widely recognized as perhaps one of the very few experts on the retractable, he knew where to go for the parts he needed. 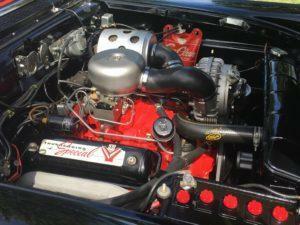 Using only NOS and reconditioned parts, Dale completed the concours level restoration in 1995. 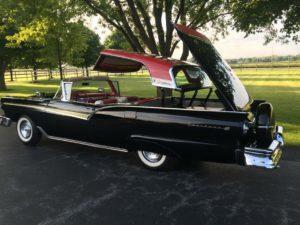 Bob took the car to the top shows where its stunning looks and the impeccable quality of the restoration consistently earned it the top awards. 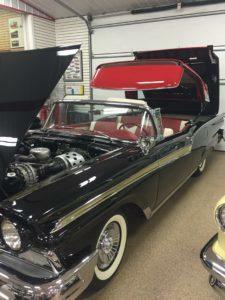 He kept the car for a few years and then took it to the Auctions America auction in Auburn, IN. There it was purchased by Don Williams who maintained the famous Blackhawk Collection and together with Richie Cline, the “Auto Collection” at the Imperial Palace in Las Vegas, NV. It went on display at the “Auto Collection” until January 2002 when it was acquired by Tom Gerrard and placed into his superb collection. Tom kept the car in tip top condition for 14 years while acquiring more awards at the most prestigious car shows. 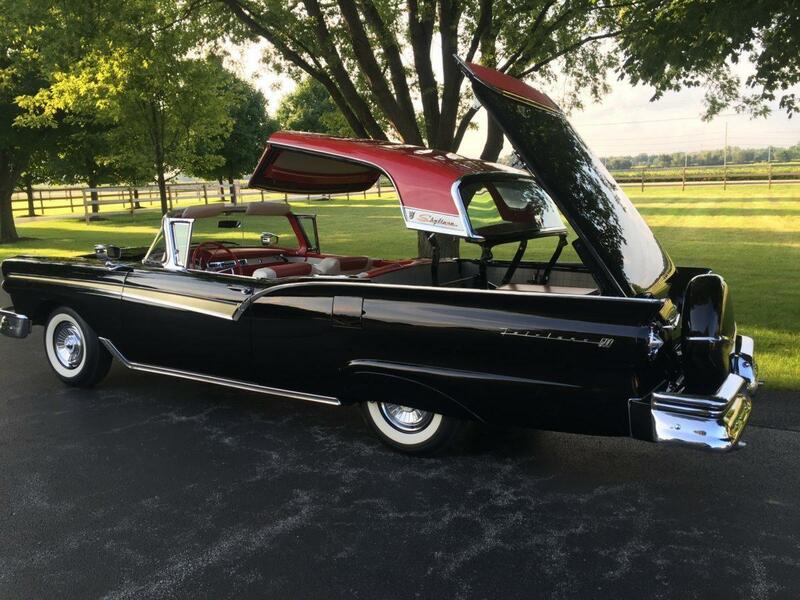 On September 3rd, 2016 Tom offered the car for sale through Auctions America in Auburn, IN where it was acquired by Ken Nagel and placed into his collection next to some of the rarest 50’s, 60’s and 70’s cars on the planet. Competition among automakers to take advantage of the unbridled enthusiasm that was bubbling over after WW II was fierce. They employed every advertising and marketing tactic at their disposal to get their share of the sales. Planned Obsolesce was in full swing in the form of annual style changes featuring outrageous space age styling cues and color palettes made up of the brightest colors and wispy, dreamy pastels. The “Win on Sunday, sell on Monday” sales tactic created an insatiable need for more and more powerful engines to stay competitive in the horsepower wars. Ford’s answer was the “F-Code” engine. The F-Code was the result of Ford, hiring Pete Depoalo an ex-race car driver, to assist in making its cars competition ready. About this time rumors began circulating that rival Chevrolet might offer a supercharged or fuel injected Corvette. Since supercharging was a whole lot less complicated than fuel injection, Depoalo recommended that one be made available for the 312 Y-Block V8. Ford acted on the advice and made a deal with Paxton to supply the superchargers. 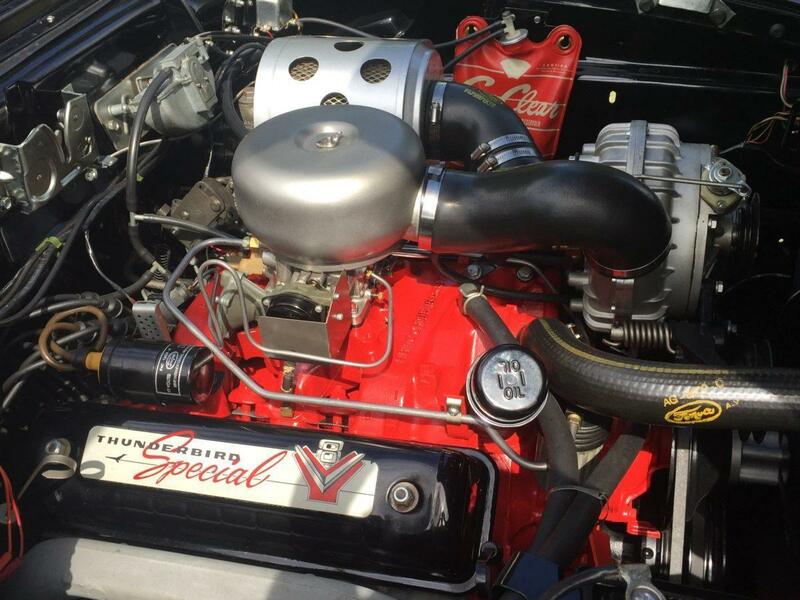 A McCulloch/Paxton VR57 supercharger was fitted to the standard 312 Cu In Y-Block. The Phase II VR57 supercharger blew 5 lbs. 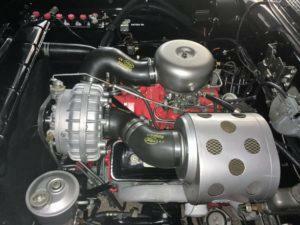 of boost into a Holley four-barrel carburetor. With 8.5:1 low compression, posted (strengthened) cylinder heads, a 256 deg duration cam, and up-rated valve gear, the 312 easily pumped out 300 HP on regular gas**. In stock form the supercharged ’57 could reach standing quarter mile times in the high 14’s while pushing the Fairlane’s to speeds of up to 100 mph at the drag strips. At both Daytona and Bonneville, they recorded speeds of 131 mph. The F-Code engine was available for $340.00 as a factory performance option on any ’57 Ford or Thunderbird. The charged-up Fords proved to be just as fast as the “fuelie” Chevrolets. Both were capable of 130+ mph top speeds. 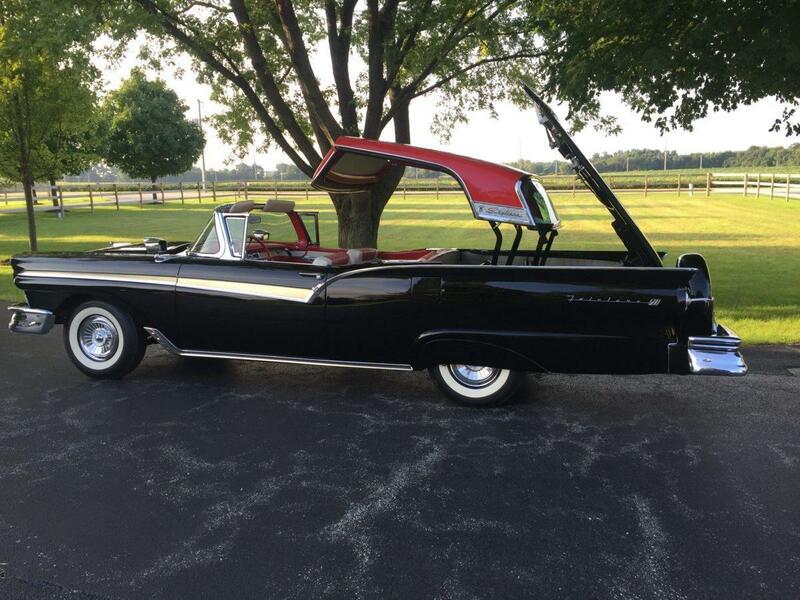 The F-code Fords of 1957 represent some of the first serious musclecars produced in the United States and are also significant because they ultimately led to the big block-powered Fords of the ’60s. The hopped-up car even made the movies. Robert Mitchum crashed and burned in a ‘57 Ford at the end of the bootlegger movie, “Thunder Road”. 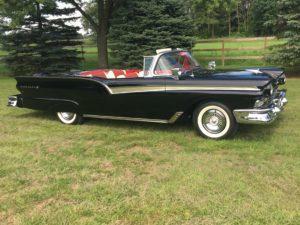 In the Late-Fifties, America was fascinated with space-age technology and Detroit was feeding the frenzy with jet-inspired tailfins, fuel-injected, multi carburetor, supercharged engines and glittering new designs every year. 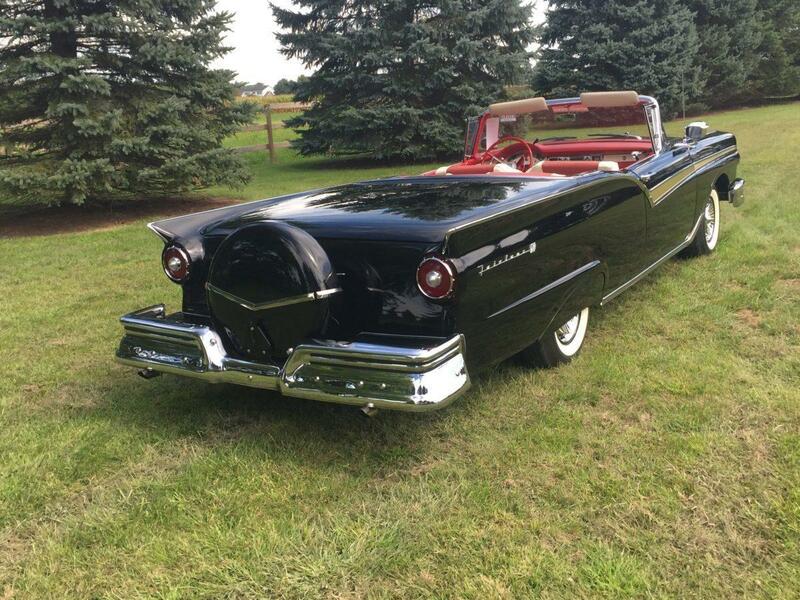 In 1957 the Ford Motor Company applied a series of innovative design principles to its automobiles. Spearheaded by chief of styling, George W. Walker. 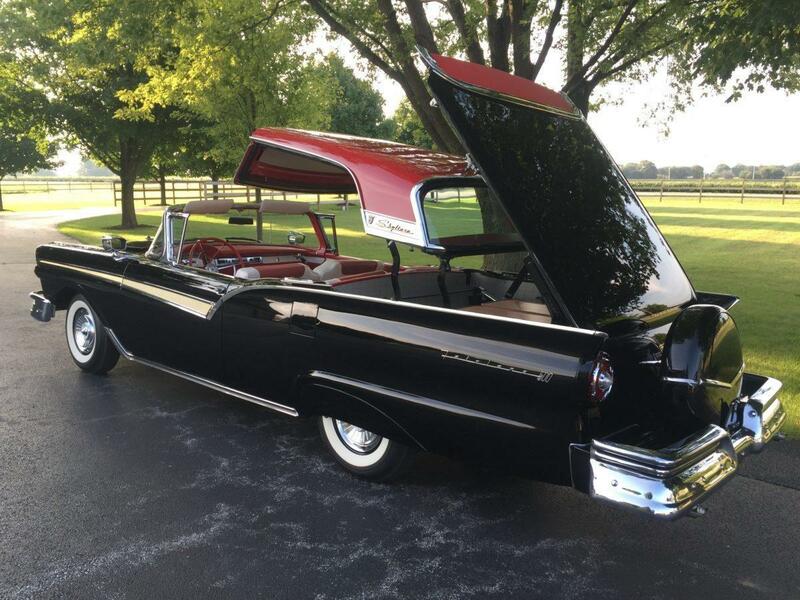 The all-new Fords incorporated a clean front-end, more defined tail fins and a full-width rectangular grille with subtle bits of chrome trim decoratively placed around the body giving it a much sleeker profile. The interior of the Fairlane’s offered a “deep dish” steering wheel, an easier to read instrument panel, safety seat belts and more supportive seats. With 37 different fabric color combinations and a selection of either standard nylon or optional vinyl upholstery, it seemed customers had more difficulty choosing a pattern than negotiating on the car’s purchase price. The ‘bigger-is-better’ Fairlane 500 set sales records all year long. 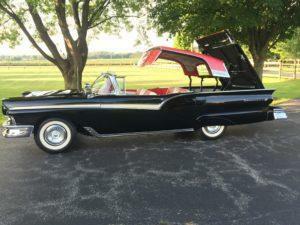 But Ford saved its biggest surprise for January when it introduced the Skyliner. 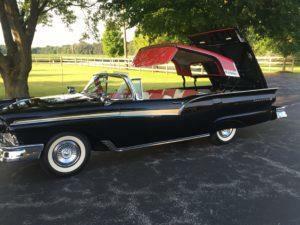 Companion to the conventional Sunliner convertible, the Skyliner was America’s first production convertible with a retractable hardtop. 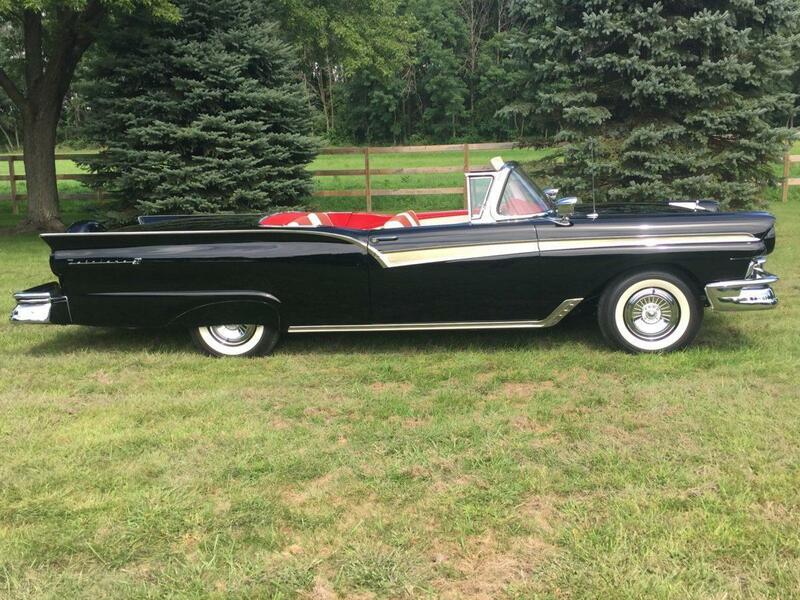 At $3265.61, this Skyliner was the most expensive Ford for 1957. 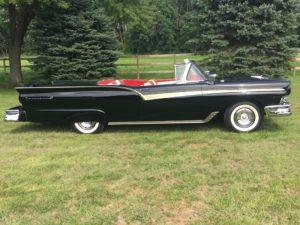 Ford advertised the Skyliner as “The miracle car of this generation, two cars in one!” Some say it was more like three cars in one; hardtop, convertible and with the F-Code engine option, a land-based rocket ship! Ford had a banner year, going on to sell 1,676,449 cars and beating their arch rival Chevrolet for the top spot. An argument could be made that it was the 20,766 Skyliners that pushed Ford sales ahead of Chevy for in 1957. Reluctant to write off the $2.2 million development cost for a retractable roof concept car incurred in 1948, Manager of Fords Advanced Styling Studio, Gil Spear, created a two-dimensional cardboard model of a retractable hardtop. The project drew the attention of William Clay Ford, the brother of company president Henry Ford II and at the time, head of Ford’s new Special Products Division. A plan to adapt the concept to a vehicle in the 1957 product line got the green light. Making the model a reality proved a challenge as the 1957 Ford line was designed without this feature in mind. The styling team made it work by stretching the standard Fairlane convertible by approximately three-inches, raising the rear deck to allow stowage area for the top, relocating the fuel tank to behind the rear seat and mounting the spare tire under the trunk floor. 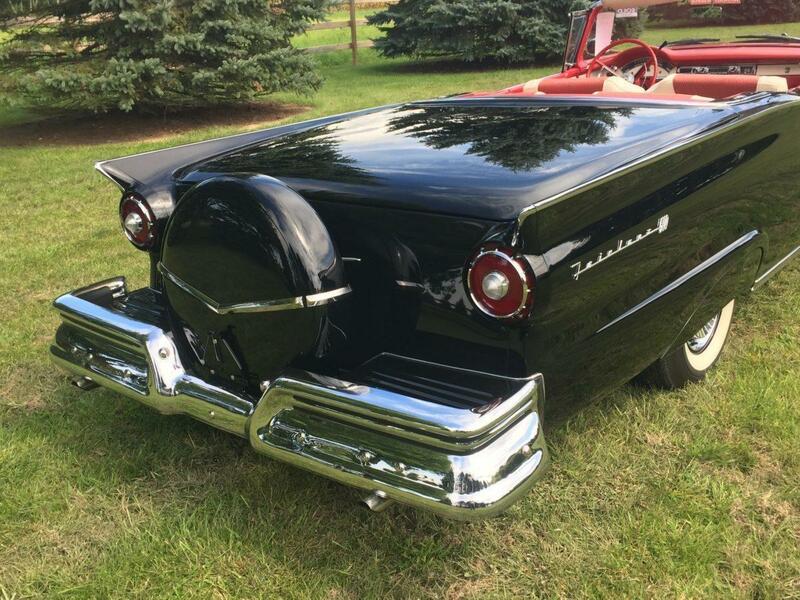 The 1957 Skyliner was advertised as “The World’s Only Hide-Away Hardtop”. In the age of rocket ship inspired fantasy dream cars, the reality of effortlessly retracting the steel top of a car and neatly stowing it in the trunk was an unexpected marvel of engineering. At the push of a button 610 feet of wiring delivered electricity to 10 power relays, 10 limit switches, 8 circuit breakers, 4 lock motors and 3 drive motors setting in motion a memorizing show that lasts less than 60 seconds. 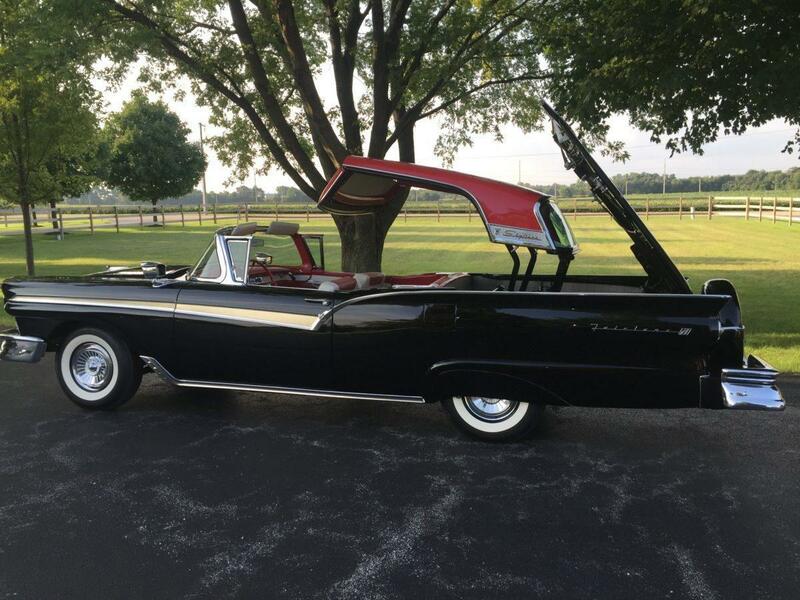 What started out as a sleek two door hardtop magically transformed itself into a wind in your hair, dazzling sun drenched convertible that could scream down the road in a great black and red blur at speeds approaching 130 mph. Despite being a technological wonder, the Skyliner Retractables were produced for only three years, 1957, 1958 and 1959. **The Phase I VR57, which was produced for NASCAR competition, was physically larger than the Phase II and produced six pounds of boost, instead of the five pounds of the phase II. Other noticeable differences are the positions of the oil pressure relief valve, input connection and output connection, the boost control valve, the webbing on the cases, as well as the band which appears to hold the two halves of the Phase I supercharger together. The phase I VR57’s were run on 312 cid Y Block engines using a 290 deg duration cam, with special low compression heads. like most other engines designed for the track, it was underrated at 300HP. The 340 Ft lbs of torque at 5300 RPM equates to more like 343+ HP (Tq in ft lbs X rpm divided by 5252). 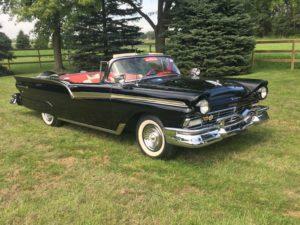 NASCAR was dominated by the supercharged Fords in 1957 in both the stock and convertible divisions. 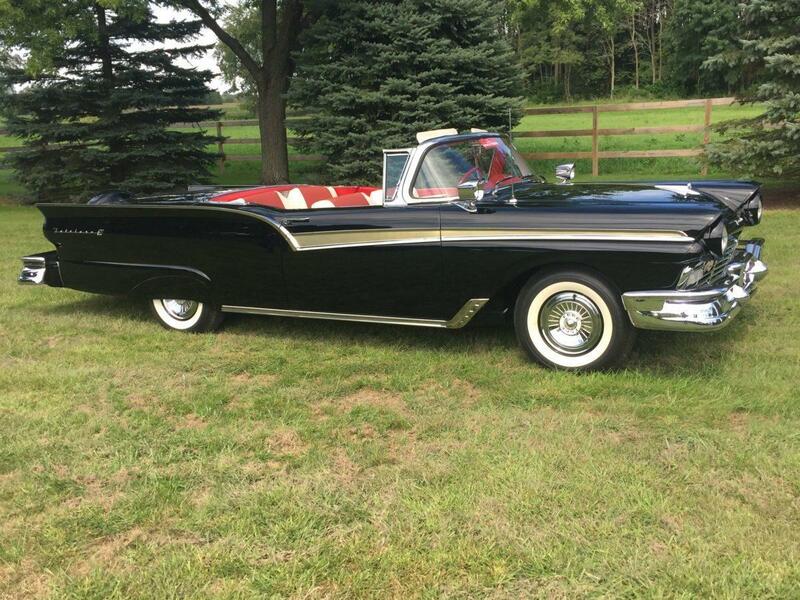 To show off the new ’57 Fairlane, a blown version lapped the Indianapolis Speedway at an average speed of 117 mph in the Stephen Trophy Trials. 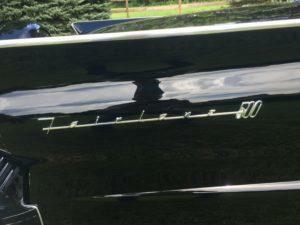 Furthermore, for twenty-two days starting September 9, 1956, two Fairlane’s were run continuously at 110 mph at the Bonneville Salt Flats in Utah. Pit stops lasted an average of 17 seconds. The cars ran day and night until the 28th when the 50,000 mile mark was reached, thus proving the car’s superior durability. Prior to this event, the same Fairlane’s broke 458 national and international performance records. The results at the annual Daytona Speedweeks event were impressive, too. The supercharged Fairlane driven by Fran Hernandez finished third with a 130.058 mph Class 7 two-way flying mile speed run.